After our day of travel on the sleeper train, we arrived in Varanasi at 1:00am. Groggy having not really slept or been able to stand up for 13 hours we were glad to arrive. The station, Mughal Sarai, was filled with sleeping passengers awaiting their trains, complete with someones cow in the middle of a hundreds of people laid on the floor. After some confusion we departed for the hotel in a bus with fewer seats than passengers so some of our group had to stand amongst our many bags. The street light illuminated a dusty dirty city complete with giant roaming pigs. The hotel was clean but had not been updated since the 1970s, given the dodgy decor, but it was a much needed bed. We arose to a late start at 10am but most of the group took a leisurely approach to the start time, understandable as everyone was tired. Binu would not be joining us this morning but had arranged Tuk-tuks for us. 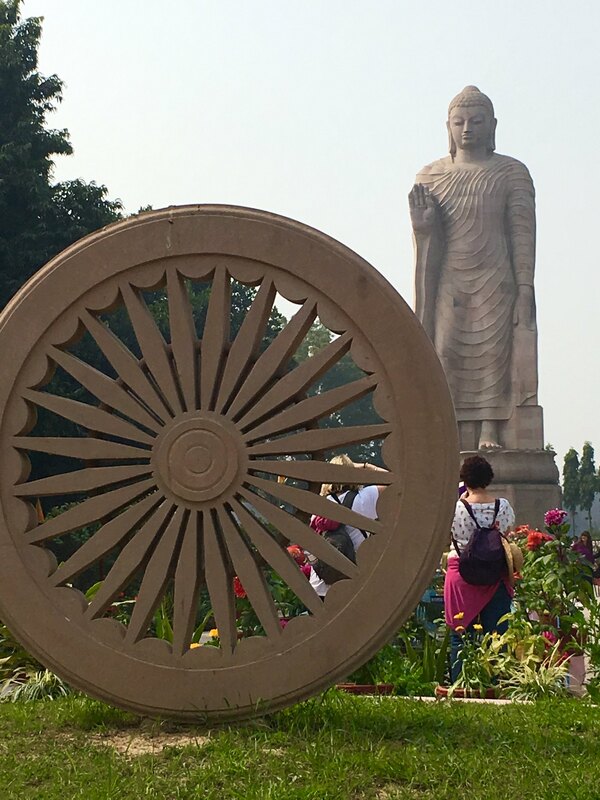 A 500 rupee round trip to see some Buddhist monuments and temples at Sarnath. Our first experience in a Varanasi tuk-tuk we held our breathe as they weaved through the traffic at pace. Tuk-tuks are in essence a three wheeled motor bike with the driver sat in front and the passengers behind. No doors makes it breezy to say the least. I was sat in the front with driver with not much space. While Mike was in the back with 2 others. The front was much less safe than the back, far more exposed and not really a seat, as the driver steers not from a wheel but motor bike style handles. Having said all that it was exhilarating; dodging cows, stray dogs, cars, rickshaws, motor bikes with three people, goats, pigs, buses and lorries. A few moments required eyes to be shut but the only way to get around given the traffic. At first we visited a Tibetan temple, quite simple, nothing spectacular. Next came a much older Buddha temple which was good for some photos. However we arrived just at 11:30am which meant the doors were being closed by the monks. Lunch operates from 11:30am to 1:30pm everyday. A shame not to see inside but the building itself and the grounds were beautiful. Not having a guide we later discovered we missed the 3rd incarnation of the tree Buddha achieved enlightenment under. Never mind. Through a gate we saw a giant ancient stupa but couldn’t get to it. Closed we thought. Our tuk-tuks took us around the corner to a giant Bhudda and gardens. While not old still good to see. The next place was worth a visit and costed 200 rupees each. We queued and paid and were harassed by sellers at every turn with singing bowls, Buddha statues and beads. Declining them all we entered. Dating back to 12AS it was a collection of ancient unearthed ruins said to be the place Buddha gave his first sermon. Quite large in size we wondered through the monuments. Signs were in English so we got an idea of what the temple use to be like. Here we also walked around the giant ancient stupa clockwise as was respectful. Many children hassled us to buy statues but we again declined. We hopped back in our tuk-tuks and took another exhilarating ride back to the hotel. We had lunch, Mike didn’t enjoy his mutton curry but my bhirani was nice and we relaxed in the hotel until 4pm. We met up with our group and Binu again and took our tuk-tuks into the main city to see the Ghats (steps on the Ganges river) that the city is famous for. Varanasi is a pilgrimage sight for Hundu’s to bathe in the holy Ganges river and cremate their dead. After another exhilarating tuk-tuk (I didn’t have to sit upfront this time!) we arrived in the city centre. Chaos. We were dropped a fair way from the Ghats as it was difficult to get through the dense traffic and people. We walked through traffic, passed cows, avoided dogs and got barged by locals heading down to the river for the nightly ceremonies. 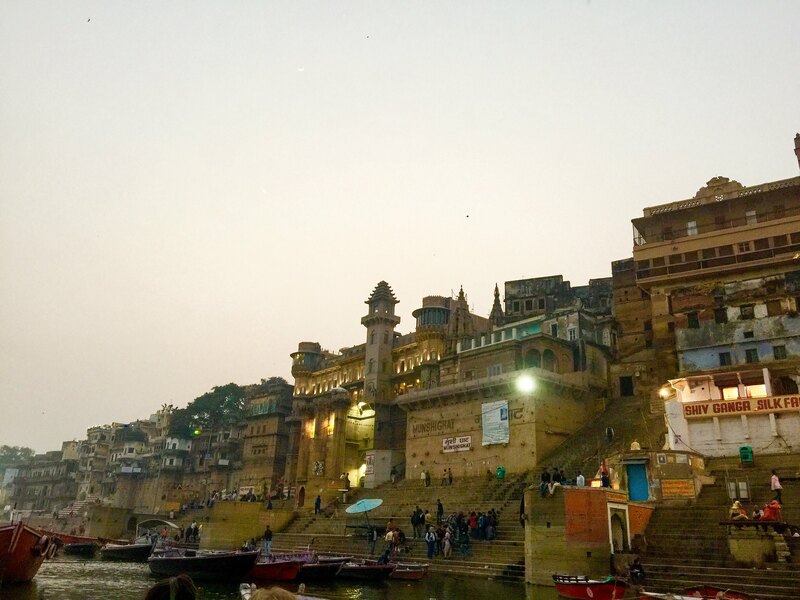 Binu agreed that Varanasi is India’s most chaotic unorganised city. Mopeds and motorbikes and tuk-tuks for that matter happily go on the wrong side of the road into oncoming traffic. 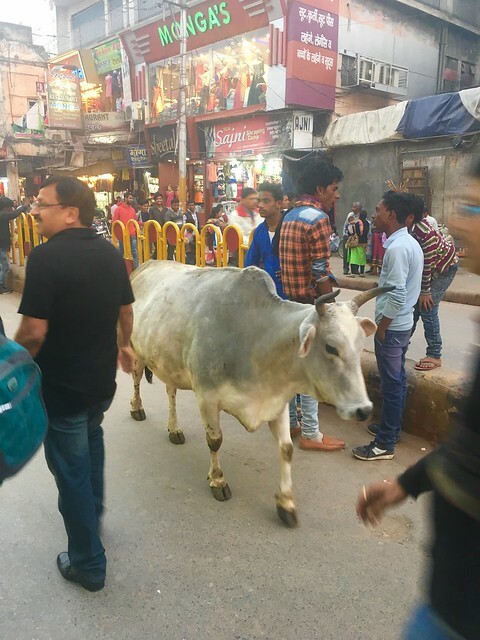 There are no sidewalks or pavements and Varanasi has free flowing sewage down the side of the street so walking through and amongst traffic is unavoidable. However one of the main obstacles are steaming cow pats freshly laid in most cases. Or as Binu called them Holy shits as cows are Holy to Hindus. Walking down to the water we were pestered by shop sellers, beggars, and woman and children wanting food. While harsh you have to just ignore these people. If you give them money it will be spent on drugs. If you want to give them food you have to open it first and give it to them so they can’t resell it. 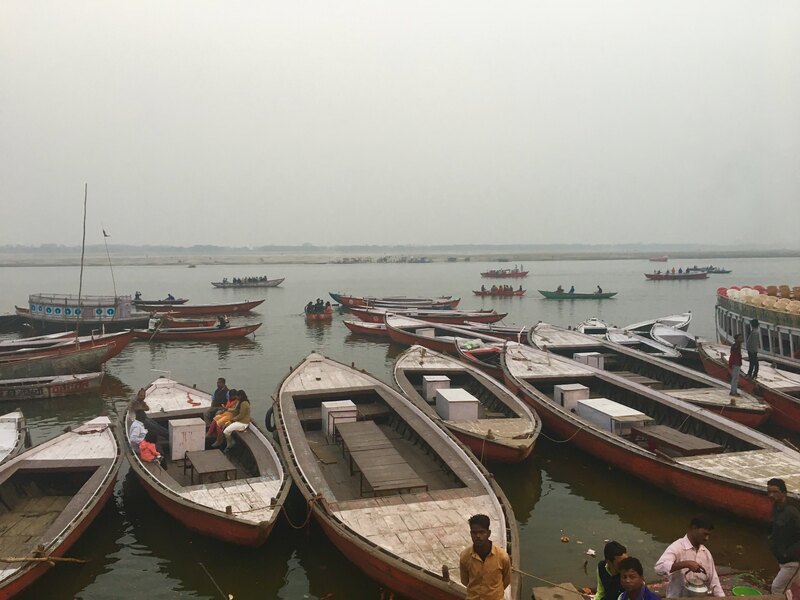 Finally arriving at the Ghats we were greeted with a dusky light and hundreds of boats awaiting guests. Steps led down to the water and even the cows (who are everywhere) were down here too (despite the cattle grid). Busy was an understatement and we boarded our boat. A row boat. Our 15 strong group sat and our 1 rower (or I guess captain) sunk his oars into the worlds most polluted river and pushed off. He must have been no more than 20 but was incredibly strong to move a boat full of large western tourists. We rode along the river, Binu guiding us about the history and significance of the area to the Hindu people. Each Ghat has a specific purpose: cremation, bathing, washing clothes etc. We could take photos at any point apart from the cremations or woman and children bathing. Not something we’d want to do anyway! Half way along our cruise we lit a tea candle, set amongst some flowers, lowered it into the water with our right hand and made a wish. They floated down the holy river and looked very pretty in the moonlight. We rowed back to where we started but by this time a Hindu ceremony was going on on shore – it’s a daily ‘show’ for the pilgrims. Packed crowds gathered round priests who used fire, incense and bells to call and pray to the gods. We watched from the river in our boat among hundreds of others. Even here the locals walked across the now sea of boats selling tea and other drinks. Once back on shore we walked through the masses and cows to a restaurant for dinner. An eventful dinner as Tom, our youngest fellow traveller, had a severe nose bleed needing medical attention. Binu called a doctor and took him off to the local hospital. Quite an experience I’d imagine! We fended for ourselves with Binu away and made our way back to the hotel (via tuk-tuks- I was in the from again). We looked forward to seeing a morning sunrise on the Ganges the following day.